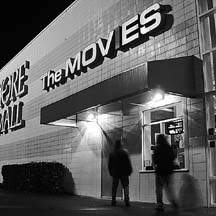 A battle ended on Friday, Jan. 14, when David Phillips of the Minor Theater Corp. signed papers that finalized the purchase of The Movies, the complex of theaters at the Bayshore Mall from Signature Theaters Inc. The result: MTC now controls every working movie house in northern Humboldt County: seven screens at The Movies, eight at the Broadway Cinema, three at the Minor Theater and one at the Arcata Theater. 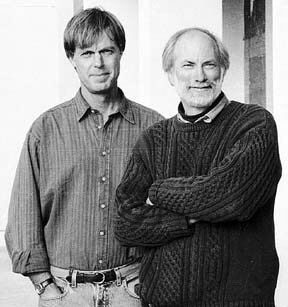 Michael Thomas and David Phillips at the opening of Broadway Cinema 8 in 1995. For many the first word that comes to mind is monopoly. Filmgoers wonder what effect it might have on what movies they get to see, where and at what price. In a conversation at the company's offices in Eureka, Phillips said the takeover will be a good thing. "The audience will be able to see films where they are shown best. Films that are more presentation-oriented will show at the big THX auditoriums at the Broadway. We're going to experiment with focusing the more family-oriented films at The Movies. "And at the Minor, it should free us up to present more films like Being John Malkovitch or like Mansfield Park that's just opening -- art films and smaller independent films that appeal to the audience in Arcata that has been clamoring for a continuous succession of those kinds of movies." Phillips and his business partner, Michael Thomas, who handles booking films, will have complete control of which films go where because there no longer is any competition. The purchase of The Movies is the last shot fired in a movie war that lasted for decades. Signature Theaters was a direct descendent of Redwood Theaters, a company that dominated the Humboldt movie business for years. The relationship between Minor Theater Corp. and Redwood is one that began 30 years ago when a group of college friends got together with plans to renovate an abandoned movie house. The Minor Theater, Arcata, Calif.
"He was into film at a junior college before he moved up here. My dad was a photographer and I liked photography. Rick was always enthusiastic about what he was doing, so he got me interested in film. I'd never really considered it as a possibility because I had been focused on still photography. "Humboldt had just been switching over from its video department to a film department. We ended up making the first student movies at Humboldt State. I fell in love with it and graduated in film in 1968. Then I went to University of Southern California for my master's in film." Then Phillips, Brazeau and a few others came up with an idea. No one can say for sure who thought of it first. John Lynch was about to graduate from HSU with an economics degree. He recalls walking by the old boarded-up Minor Theater while thinking to himself, "What am I going to do when I finish school?" 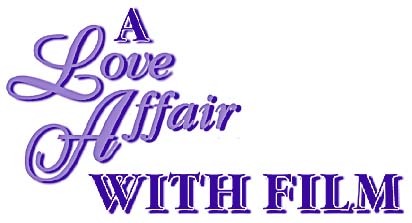 The original partners included Phillips, Brazeau, Lynch, Fred Neighbor, Faison Jordon and Michael Thomas. 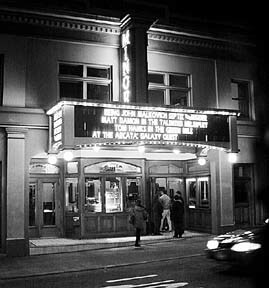 Thomas, a friend of Brazeau's who did not live in Arcata, at the time was booking shows into theaters such as the Warfield in San Francisco. They tracked down the owner of the Minor, June Timmons, a niece of Isaac Minor. When the partners applied for permits to restore the building there was some opposition. Lynch recalls that it was a time when the old guard feared the newcomers who came to Humboldt, graduated and stayed. 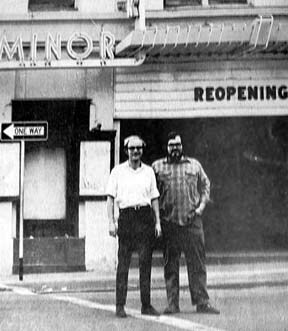 John Lynch and Rick Brazeau post in front of the Minor Theater, 1971. The City Planning Department initially said that the project would require considerable additional parking, one space for each five theater seats. MTC persevered, arguing that since the films would be shown at night the impact would be during off-peak hours. They finally were granted a variance on a six-month trial basis. "The grand idea was to get a bunch of people together and open the theater and, if luck was on our side, to use the profits to finance any sort of fledgling film company we could come up with," Phillips said. "We started the project in the fall of '71 and we opened Jan. 1, 1972." Opening night at the new Minor featured a double bill with two classics, the Marx Brothers in Night at the Opera and Clark Gable in San Francisco. In the beginning the movie house booked no first-run films. The fare was mostly "repertory" films with a few art house features and foreign films. The dream of using the revenue to do their own movie-making never came to pass. 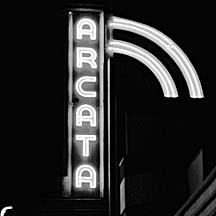 The work of running a movie theater continued to grow and the company expanded with the acquisition of the Arcata Theater in 1974 followed by the purchase of the Arcata Drive-in. With the company running all of the theaters in Arcata, its competition naturally were the theaters in Eureka, all run by Redwood Theaters. "Redwood had about 13 theaters spread around Northern California from Ukiah and Modesto to Red Bluff and Auburn and, of course, in Eureka. They were all little theaters in small towns doing what small town theaters do." Redwood was a company run first by George Mann and later by his son, Richard. George had taken over operation of the Minor back in the '20s and he built the Arcata and Fortuna theaters. Calling the Manns competitors was an understatement, Phillips said. "The fact is there was no competition. There couldn't be. In fact, we bought this theater from them. At their whim they could have crushed us." When any new films were released, Redwood got first choice since it had the clout of a multitheater distribution deal. "Whenever they ran a film in Eureka they would run it as long as they would want to, and when they were done with it, we could have it. The way it works is that the antitrust laws allow theaters to have a noncompetitive environment through a zone system. "In the case of movies, the big distributors are allowed to sell their films to only one person in the marketplace. So they could say they didn't want the Minor and the Bayshore Mall to show the same film at the same time." The limited access to first-run features became a bigger problem as the industry evolved in response to changes in technology, in particular the growing popularity of the VCR. "Videos were seriously affecting our natural audience. It was essentially a repertory theater and a certain portion of our audience was opting to stay home and watch something like the Marx Brothers or other older films on video rather than going to the theater." The growth in the video market forced a response from the studios. First, it shifted toward making movies that took advantage of the difference between film and television -- expensive blockbusters that people would leave their homes to see on a big screen. "Many of the industry prognosticators had been predicting doom and gloom: `Video was going to mean the end of movies.' Studios began contracting their production slates down from 20 films a year to 15, then 12 and on to a point where only a handful of films were being made by each studio. If one or two of them didn't turn out to be huge blockbusters the studios faced bankruptcy." Ironically, the savior of the studio system turned out to be video. "Videos were generating a lot of ancillary income," Phillips explained. "The result was that films that did so-so business in the theaters -- films that would be have been considered failures because of the huge expectations and high production costs -- they would find a home in a video store and generate income. Suddenly, marginal films became profitable and that evolved into a willingness to take greater risks. "More films were being made and that put more pressure on the repertory theaters. Suddenly, survival lay not in repertory, but in first run -- quirky films, independent films, challenging movies. But at that point in time, we couldn't run them. We couldn't get them and the audience for older films was defecting. We knew we had to evolve or we would be in trouble." "We had gone along with (Redwood's) demands for years. The turnover had been fairly quick until they built the Bayshore Mall and added four screens and then added two more screens to the Eureka Theater. (Redwood also operated a triplex at the State Theaters on Indianola.) Since there's not that many films out there, they were saying, `We're gonna hold on to these films forever.' They were clearly going to put us out of business." Phillips decided his only choice was to fight back. One major victory came in November 1992. "We went out and hired Lou Leneioni, the largest independent booker in the United States. He had clout, and to make our point he got us Malcolm X. (Redwood Theaters) wanted that film and we got it. It showed that we could turn the tables. "We made the point that if we were forced to survive by being competitive, it would be bad for everybody because it raises the cost. The winners are Paramount, Buena Vista and 20th Century-Fox, not little independent theater owners like us. "We worked out an arrangement with Redwood Theaters where they said they would drop their clearance demands after their initial contracts expired with the distributors. It still meant they had a clear run in Eureka for four to six weeks. "We negotiated a solution that sort of made everybody happy. But in a weird way; by not being sensitive to our problems, Redwood Theaters forced us to explore choices we never would have. It was survival. They were draining every last nickel out of the audience and, what's worse, they were treating the audience with contempt. You had to see it at their theater or wait a year." Then the tables began to turn. "We had always wanted to run a really first-class theater with first-class presentation. We couldn't afford to do it in Arcata, but what about Eureka? "We did some market research and determined that there was a big enough audience in Eureka to support another theater (that) could sustain itself and give us some marketing opportunities in Arcata." 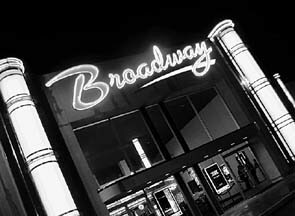 A building that had housed a failed Pay `n' Pak hardware store was purchased and converted into the Broadway Cinema 8, an eight-screen multiplex. Front of the Broadway Cinema 8 in Eureka, Calif.
"We introduced stadium seating, THX auditoriums and a state-of-the-art environment to an audience that had been paying full price for something they weren't getting. The response was dramatic." People flocked to the new theater. Those who had not been going out to movies saw the difference a well-built theater can make. The new theaters added a new twist to the ongoing battle with Redwood Theaters. Shortly after the Broadway Cinema 8 opened, the chain closed both the State triplex and the Eureka Theater to concentrate on The Movies. Ultimately the effect of the Broadway was to increase market for movies in general. Now the attendance even in Arcata is higher than it was before the Broadway opened. The battle with Redwood Theaters over who gets which first-run film continued to rage through all the changes. Then, in 1996 things changed again. "There was a guy named Phil Harris who had built some theaters in Santa Cruz, in Oakland and in Davis. He approached Redwood to suggest a merger and they agreed. The combination became Signature Theaters." "They invested about $600,000 in upgrading the aesthetics and presentation at The Movies. As I understand it, that was more than Redwood spent building the place." But even though Signature was only booking The Movies, they still had first choice on certain films. The distributors -- Warner Brothers, Buena Vista, Universal and the rest -- faced tough choices in a competitive market like Eureka. Front of The Movies, Bayshore Mall, Eureka, Calif.
"On the one hand, they have a theater with superior presentation where they know they will get a lot of people. On the other hand they have a chain that has theaters in a lot of other markets and they want to make them happy." The results were sometimes not in the best interest of the audience. A film like Saving Private Ryan would have benefited greatly from the Broadway's THX system, but it opened at the mall as did the quirky indie film, Election. On the other hand a family film like Prince of Egypt, which opened at the Broadway, seems ideally suited for the mall crowd. Now that Minor Corp. has consolidated ownership of all 15 screens in Eureka, Thomas and Phillips will make their choices without the hindrance of competition with a few exceptions. One is the Garberville Theater, owned and run by Chris and Bridgette Brannan. That 325-seat theater has been operating continuously since 1935, according to Susan Akselsen who owned the old movie palace for 18 years before selling it to the Brannans. And Minor Theater Corp. had run the Fortuna Theater briefly before the opening of Broadway Cinema 8, Phillips said, and that was the beginning of the breakdown of the exclusive bookings enjoyed by Redwood. 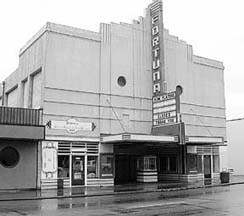 "Fortuna was the first theater in the area to be able to play the same movies as Eureka, (but) it was difficult to operate it as a single-screen theater. Some distributors would want you to show a new release for a whole month. After the third week pretty much everybody in Fortuna had seen the movie and you're stuck." After the company ended its run at the Fortuna, it was taken over by Sherie and Guy Stuart, owners of Empire Lanes bowling alley. According to Sherie, the couple operated it from September 1997 until Jan. 2, 2000. The Fortuna Theater, Fortuna, Calif.
Stuart said she thinks the town is big enough to support a theater. The problem was the building needed repairs badly and the owners, North American Cinema, did not contribute to its upkeep. "I didn't want to put a bunch of money into a building I didn't own," said Stuart. The screen has gone dark but probably not for long. "I've heard that a company is negotiating to buy it, one that operates out of Sebastapol owned by Dave Corkle," Phillips said. Corkle runs theaters in Sebastapol, a triplex in Willits and is just finishing up a four-plex theater in Cloverdale that opened Monday. The Signature chain still owns the Eureka Theater, part of the deal with Redwood, but aside from running special shows a couple of times a year to maintain its permit, the theater has been dark for years. "I don't think they have any intention of reopening it," said Phillips. "It's a beautiful theater, a great old theater. It's going to take some money to fix it up. I really wish the city of Eureka would turn it into a performing arts center. It would be fabulous to have a 1,700-seat theater that has that Eureka tower on it." Phillips conceded that for about a year attendance at the Arcata and Minor dropped, but it has rebounded. The Minor had gone through a number of upgrades and the addition of two smaller screening rooms in what had been adjacent office space. The acoustics were also altered and Dolby sound was installed. And what about the tired old Arcata Theater with its tower? "When we stabilize our situation after this change we're going to start paying more attention to the Arcata," Phillips promised. "But we're probably going to need some help to do it. At this point a single-screen theater is an anomaly and in a community this size it's difficult to make it work as a movie theater. "Theaters like the Arcata and the Eureka have to become more than movie theaters. They have to cross over and become a performance space and a community facility. They could become real landmarks. "The Paramount Theater in Oakland is doing just great. They run classic films from time to time and then the next week they'll have a concert there. Then the next week they'll have a benefit. It's become a landmark place." Still on the horizon is a major project Phillips and his partner are putting together -- McKinleyville's first movie theater. "We're working on it," said Phillips. "We've taken the first step, getting the county's approval last year. Now we have to put it all together. We're working on the plans now, designing it from the ground up. It's going to be great." Still in the planning stage is this model of McKinleyville's first movie theater. After seeing the magic Phillips worked converting the Pay 'n' Pak hardware store into a cinema, it's not hard to believe his prediction. "One of the reasons I got into film in the first place is because I get a kick out of doing stuff for an audience," he said with a smile. "I never got back to making films. It didn't work out that way. But since we've been sidetracked into this, we want to present movies the best way we possibly can. And that's what we are going to do." THE MINOR IS POSSIBLY THE OLDEST THEATER IN THE UNITED STATES constructed to show feature films. David Phillips thinks it may even be the oldest in the world, in part because the theater was built at a crucial time in the history of film. "It was only a matter of maybe 18 months prior to the opening of the Minor that there was any such thing as a feature film. They didn't exist at all up until 1912. Up until that point they were all one-reelers, nickelodeons. They were essentially like a freak show or a magic show, something shown as an adjunct to vaudeville. View from outside of the Minor on opening day, Dec. 13, 1914. "The Minor was the first building built in Humboldt County as a true movie theater. The State Theater in Eureka was a converted vaudeville house like most early movie theaters. "There were several theaters on the Plaza run by a woman I've never seen reference to her first name she is remembered as Mrs. Pettengill. They were nickelodeons in store fronts." The Pettengills showed one-reelers at the Arcata Pastime Theater and at Excelsior Hall, a building built by businessman Isaac Minor who had come to Arcata when it was known as Uniontown. Minor had prospected for gold in Trinity County, but he found running supplies from the coast to the gold country to be more lucrative. After that he had a long series of successful businesses including dairy and cattle ranching. He was a partner with Noah Falk in lumber mills and also ran a shipyard and a granite quarry. He built a railroad to haul the granite and founded the National Bank of Arcata which was in competition with Bank of Arcata, run by his former partner, Falk, along with Henry Brizard and others. By 1913 Minor and Falk were both getting on in years and each wanted to leave behind a lasting monument. "Isaac was on the verge of retiring and he had a lot of money," said Phillips. "One of the things he wanted to do was build Arcata's first big hotel. Noah Falk wanted to do the same thing, and they had this race so see who would be first. Minor bought the property where the Minor Theatre is today. Falk and his partners bought the property on the Plaza where the Hotel Arcata Hotel is today. Falk got started on the hotel, and it was obvious that he would be first, so Isaac stopped his project. "Mrs. Pettengill was running these theaters on the Plaza and since Arcata was still a small town, maybe 1,200 residents at that point, everyone knew about the rivalry between Falk and Minor. She approached Minor and he supposedly said, `Well, if you've got the know-how, I've got the money.' She talked him into doing it and when it was done it was known as Pettengill's Minor Theater." One of the concerns about building and running a movie theater in those days was fire. Film stock was made with nitrate, an extremely volatile substance and the arc of the carbon rods (in the projectors) was akin to a welder's torch. With that combination, theater fires were not uncommon. So Minor built the theater using concrete. He designed nine exits to the building and added other features to insure safety. "The projection booth was completely steel clad and the floor was concrete. The glass ports that the projector shown through had a device with a metal shutter suspended by cloth ropes so if something caught on fire they would collapse and seal the room. On opening night Minor got up on stage and declared that the theater was the safest place to be if there was a fire in Arcata." The theater opened Dec. 13, 1914, with a silent film, The Chimes, one that is now lost along with the vast majority of silents. (Another problem with nitrate film stock is the fact that it deteriorates over time.) They sold out two shows, each for an audience of 525. "Just about every living soul went to the movies that night. Of course Minor was there; he is in the opening night shot. He's the guy sitting right on the aisle with the white hair and bushy beard; he's wearing a sort of welder's cap. Ironically, within a year he was dead." Aside from a few temporary closures, the Minor continued to operate continuously until 1960. It reopened in 1972 after major renovation by the Minor Theater Corp. 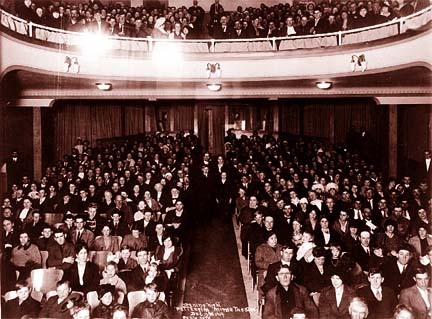 Opening night of Pettengills' Minor Theatre, Dec. 13, 1914. Isaac Minor was seated in the audience, as seen in the silhouette detail. © Copyright 2000, North Coast Journal, Inc.